Many people feel like they have to feed their guests a meal during a birthday party – not true. Planning your party between meals is perfectly fine! Perhaps 10am-12pm or 2-4 would work? Plus, with so many up and coming food allergies, it’s probably safer just to do a few snacks anyway. Less eating means more time for activities too! 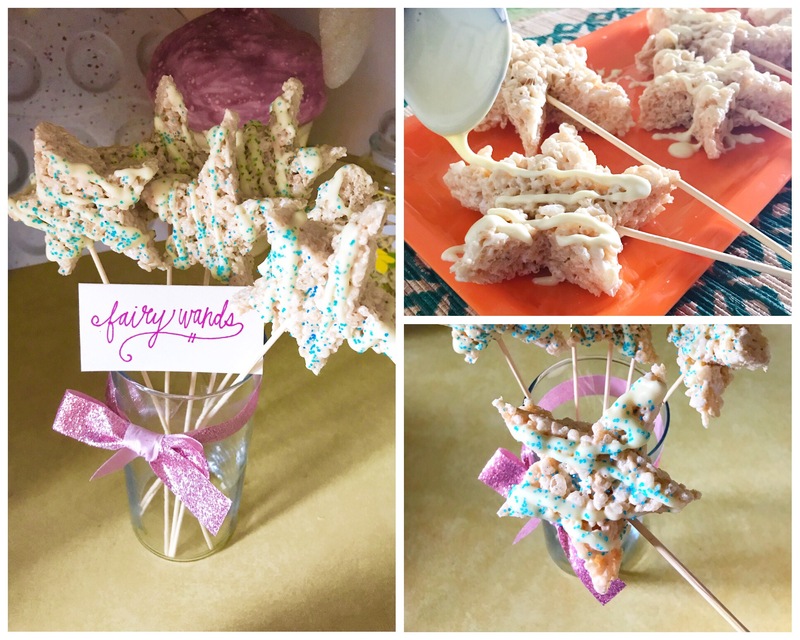 In this post, I’m going to take one of the simplest snacks/desserts, Rice Krispies Treats, and instead of making them into boring squares (no offense crisped rice cereal), I’m going to make them into stars for FAIRY WANDS! The fairy wands are going to tie into my next blog post so stay tuned! You may think the wands are too fun to eat but don’t let them trick you… they’re still tasty and still supposed to go in your belly. Have your birthday kiddo help you out before the party, or make them a surprise! Either way, they’ll be a hit – an easy to make, stress-free, inexpensive hit that will inspire others to make when they host their next birthday party. A pan – or multiple pans depending on how many guests will be attending your party. White chocolate and a bowl – for melting and decorating the wands. If you don’t have any of these things on hand (pans, star cookie cutter, etc.) ask friends and family first, they’re always willing to help out. If you still need a few things, head on over to the dollar store. Once you have all you need, make the Rice Krispies Treats, use your cookie cutter to cut out stars (or cut by hand if you’re feeling adventurous), place the stars on skewers, set aside. Get your white chocolate chips, dump them in a microwave-safe bowl and heat until melted, Start with 15 seconds so as not to burn the chocolate! Stir. After the 15 seconds, set it for 5 seconds, stir and check. Keep doing so until all the chocolate is melted. Grab a spoon, dip it in the chocolate, and drizzle it over the stars. OHHHH! Pretty! If you have some sprinkles laying around, throw some of those on too for a little extra magic! Put wands in the freezer for 10 minutes or until chocolate sets. These sweet wands prove it – snacks don’t have to be extravagant, expensive, intricately decorated, or color coordinated with the balloons. They can be simple, inexpensive, goofy, and very homemade looking – that’s where the love comes from, right? Hosting a party shouldn’t be about impressing and pleasing every guest at the party, it should be about doing what you know your birthday boy or girl would love and what they’ll cherish forever. Do you really think they’ll remember what they ate on their 7th birthday? Probably not, but they will remember that you were there and wanted to celebrate another year of their life! Previous Post Playful Puppet Party!